The VW ID Cross concept. Volkswagen is developing an entirely new range of avant-garde electric vehicles. At the recent Auto Shanghai 2017, Volkswagen provided an important preview of these new frontrunners of electric mobility. VW chairman Herbert Diess says the company plans to boost annual sales of electric vehicles to one million units by 2025. The ID Crozz will play a key role in that, he says, and production will begin in 2020. The four-door car is the brand’s first electrically powered crossover utility vehicle – a coupé and sport utility vehicle in one. After the premieres of the ID (Paris, 2016 ) and ID Buzz (Detroit, 2017 ), the ID Crozz now follows as the third member of the ID family – a new generation of zero emission vehicles with long driving range, charismatic electric mobility design, and a new interior world. The ID Crozz was conceptualised as a sporty, interactively designed zero-emission all-rounder – with electric all-wheel drive that is equally impressive in the urban environment as it is on the tracks of an active lifestyle. The ID Crozz delivers power of 225kW, has a top speed of 180km/h, and can cover up to 500 kilometres (NEDC ) on one battery charge. The high-performance battery can be charged to 80 per cent of its energy capacity in 30 minutes using a fast-charging system (at 150kW DC power ). The concept car switches to the fully autonomous 'ID Pilot’ mode when the driver touches the VW badge on the steering wheel for three seconds – and then the ID Crozzdrives with autopilot. All of the concept vehicle’s instruments and controls have been implemented fully digitally. The most important information is projected into the driver’s visual field by augmented reality. Gesture control is gaining in importance. A newly developed light shade in the transparent panoramic sunroof is even activated by gesture control; the shade offers a new form of interior and exterior ambient lighting. Meanwhile, a new CleanAir system continually guarantees good air quality in the vehicle – in all outdoor conditions. The zero emission design of the ID Crozz expresses its electric mobility DNA in every component. 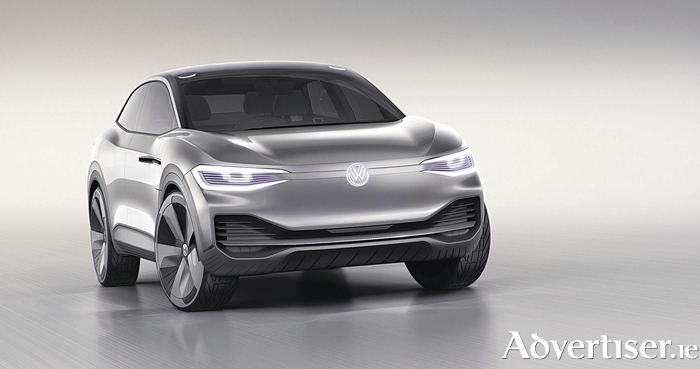 One dominant visual characteristic is the light signature for Volkswagen electric mobility. The light elements – C-shaped LED daytime running lights and variably controllable LED headlights – merge to form a front end with electronic moving 'eyes' (interactive spotlight ). In 'ID Pilot’ mode, these ‘eyes’ communicate with other road users. The ID Crozz is more compact than Volkswagen's latest production SUV, the new Tiguan L (Chinese version ) - also produced as the Tiguan Allspace for Europe. And yet the CUV provides just as much space. This is because the ID Crozz is based on the new, innovative, next-generation architecture for Volkswagen electric vehicles. The suspension and drivetrain modules are positioned far to the outsides of the vehicle and exhibit very compact construction. The battery is even fully integrated in the vehicle floor. The seat configuration offers great flexibility. It creates space that can be put to optimal use - a generously proportioned and newly designed 'open space', which exceeds typical class standards. The rear? It has premium class dimensions. Want to take your bike away with you for the weekend without having to mount a cycle rack? No problem. Simply slide it crosswise into the rear seating area. Fold-up rear seats and doors that (electrically ) open very wide make this possible. Smart Sustainability: Volkswagen is advancing the development of innovative electric car models for high-volume production. Intuitive Usability: VW focuses on cars that are intuitive to operate and feature new display and control concepts. Connected Community: VW will in future interconnect humans, cars and the environment via a Volkswagen User-ID. Automated Driving: VW will make cars even safer and more comfortable by automated driving.